Brimstone has one of the most unique designs of all Rock Lords (apart from those circular Shock Rocks). Not for Brimstone the indignity of a head upon his shoulders, instead he is like a childish doodle - a face with arms and legs. But what a face with arms! Brimstone's face is very monstrous, like a reptile with big pointed white teeth. The mouth is sort of articulated, but only closes if you push the top of the head down rather than the jaw moving. It's a very imposing and unforgettable design though, with his big orange scary eyes and giant fangs! Apart from the obvious (his body is a face!) another interesting thing is that he is assymetrical - most obviously in his shoulders which are different shapes. This really helps to push forward the idea that he's a giant rock man. He is a deep red with gold highlights, a combination that really pops. His arms move up and down, he has elbows and leg rotation, though they only bend sideways at the knee (he can walk like a crab!). His arms may be a bit short, but then again his entire body hardly subscribes to the ideal human proportions, so it just adds to his overall strangeness. 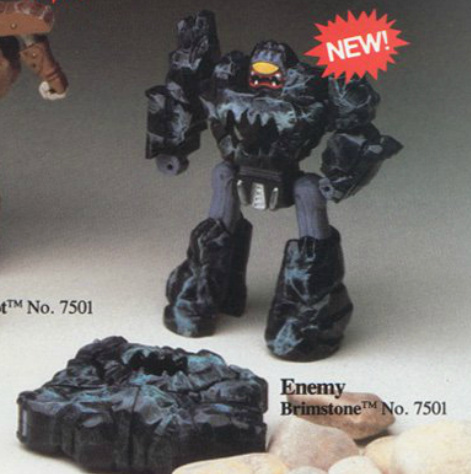 At the prototype stage, Brimstone was very different. He was going to have a flip-up head with the centre of the chest being teeth (a bit like The Thing, I guess) but they went for the old 'head in centre of chest' instead. I think I'm glad about that; the really strange design means the world of Rock Lords is even more varied and odd. Brimstone's weapon is called 'The Torcher'. As you should be aware by now, this means it is clearly nothing to do with torches or fires, but instead it's an axe. His bio even describes it as a "flame-throwing weapon", but again, it's an axe. It cuts things. It's also a lovely shade of gold which goes well with his gold highlights. Brimstone's transformation is clever but slightly annoying. His legs fold in sideways on the bottom, while the arms tuck into the side and hands slot into little holes. The problem is due to the lack of clearance they have to be folded in at the right moment or they get caught on the legs. Once you're used to it, it's fine but can cause frustration. The head doesn't really hide: the mouth closes so it lies a bit flatter, but that's it. His rock mode locks together very nicely as a rock, and it's hard to tell where humanoid mode parts go... apart from the giant face in the middle! There's no effort to hide the head, and so we're left with a rock with big orange eyes in the middle. It's a shame, but at the same time it's sort of brilliantly weird. Why shouldn't a rock have scary eyes? Brimstone is unique. He's got an interesting transformation and a really strange looking design. If there was a way to hide his face in rock mode he'd be perfect, but there's a certain charm to the scary rock-face. Man. Should have gone with with prototype, he looks absolutely awesome.